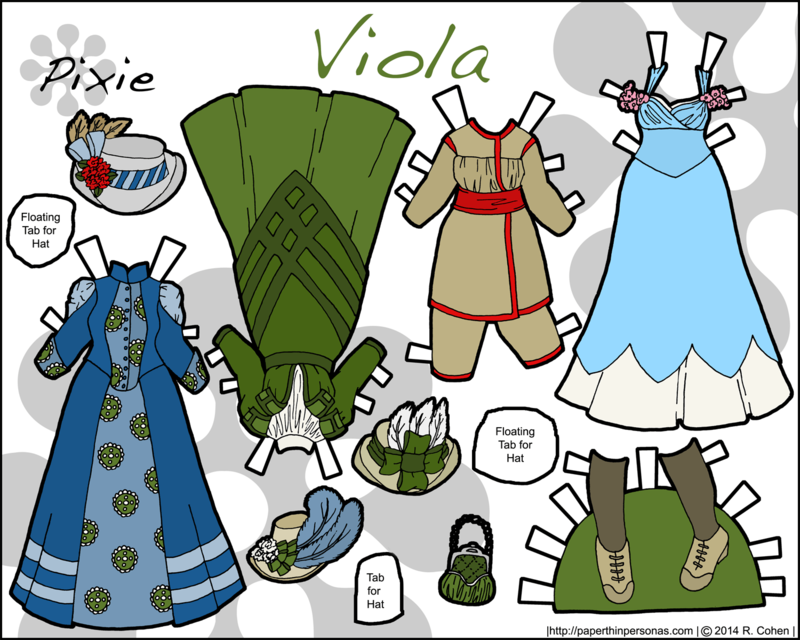 We’re traveling to the turn of the century today for Viola, a printable paper doll with her wardrobe from 1895 and 1900. She can be printed in black and white or in full color. Viola’s name was selected from the Social Security Baby Name Index as popular in the 1890s. Fashion in the mid to late 1890’s exists between huge puffed sleeves and the rather horrid pigeon breasted look. Not being a fan of either style, I never thought I would do 1890s paper doll, but I found I liked the fashions at the end of the century, so here she is. The mid to late 1890s wardrobe that Viola has is based on museum objects, primarily, and a few costume plates. The Met, The Museum at FIT and MFA Boston, as well as the UK National Trust were a few of my sources. 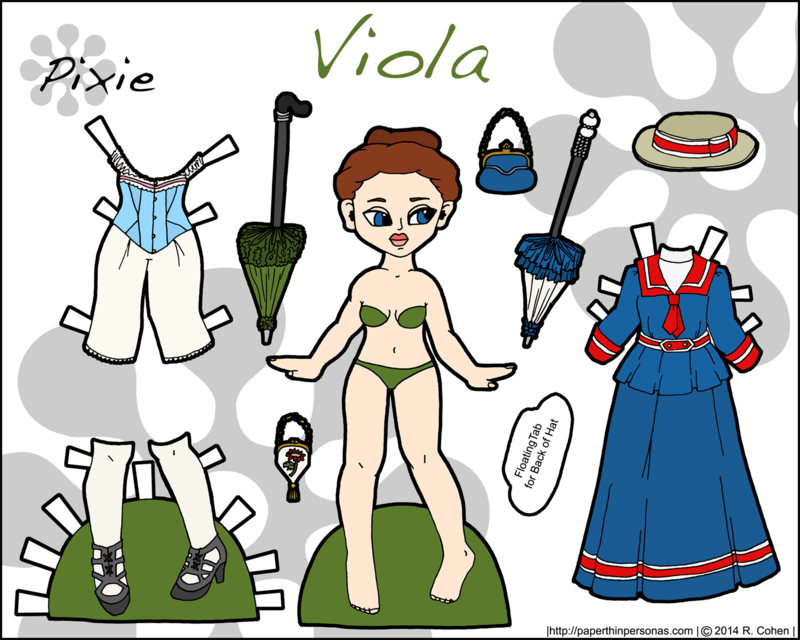 When I am researching a new paper doll, I tend to collect my sources on my Pinterest boards (feel free to follow) and today’s printable paper doll is no exception. I gathered her clothing sources on my Turn of the Century board, before I started drawing. The Sources, Left to Right: The pair of shoes from the Museum of Fine Arts in Boston from 1898. Her corset was an amalgamation of several corsets which you can see on my Turn of the Century pinterest board, however, this corset from 1900 and another corset from 1900 were big influences. I chickened out of making the corset patterned, a fact I regret. One of her parasols was based on this one, but the other I rather invented based on a lot of various parasols I looked at. The Met actually has a really large collection of parasols, who knew? Her seaside or yachting costume was inspired by this dress from 1895. There seems to have been a real “sailor” trend in the end of the Victorian period during the bridge into Edwardian. A visiting or afternoon dress based on a gown from the National Trust Collections of the UK. The carriage toilette in green is from this fashion plate I found on flickr, though I confess to usually trying to avoid finding things on flickr, since I don’t always trust the accuracy of the sources. Her gym suit is based on this French one with the shoes borrowed from this gymsuit from 1893-1898. The ballgown comes from a design by The House of Doucet circa 1898-1900. 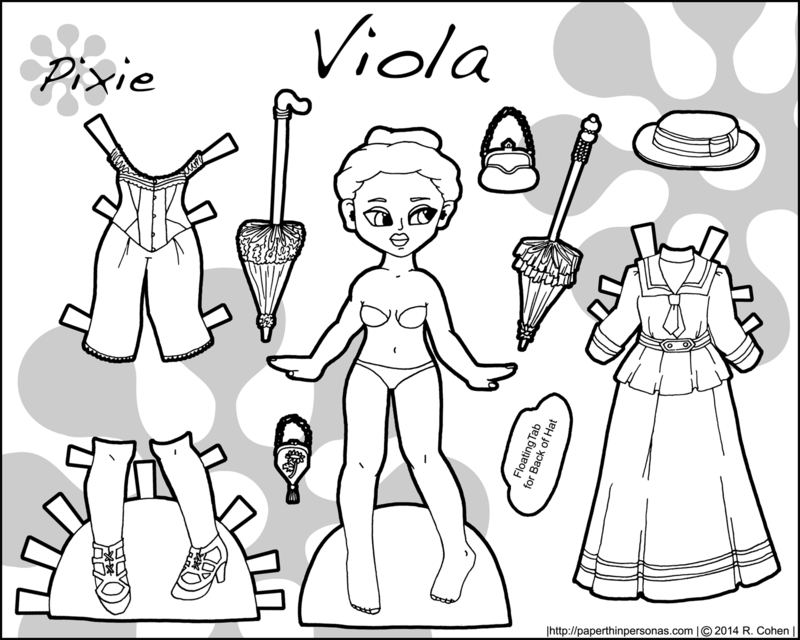 Were I to draw today’s historical paper doll again, I would have included a pair of gloves and another pair of shoes, but that would have made her three pages and I wasn’t about to that. 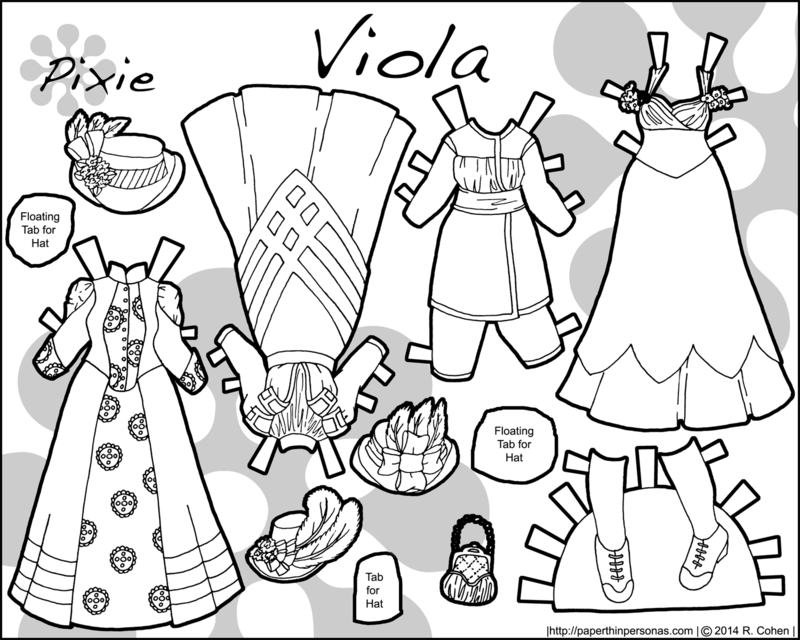 Of course, should you wish to add gloves, than I will direct your attention to the Regency Pixie Paper Dolls whose gloves could certainly be adapted here.